Call Today For Available Times And Dates! Click here for our Offshore Charter Rates! Everyone wants to catch the big one and at FishTaxi Charters that’s exactly what we set out to help you do. Our Coast Guard-licensed charter-fishing specialist, Captain Ryan has more than 25 years of charter fishing experience. Not too many charter captains in the Tampa area can claim that kind of experience. With all that expertise and knowledge, Captain Ryan knows where the fish are located. So whether your game of choice is Red Snapper, Kingfish, Grouper, Mackerel, Amberjack, Mahi Mahi or Cobia, FishTaxi Charters will make sure you get to the best locations in the entire Gulf. Our Clearwater deep-sea fishing charters leave port from the Salt Rock Grill restaurant located in Indian Shores Florida. We are located just minutes away from Clearwater, Tampa, St. Petersburg and Sarasota. That makes us quick to get to and easy to find from all Pinellas County gulf beaches. Plus, did you know that the Gulf of Mexico is home to some of the best deep-sea fishing in the entire country? In fact, more grouper are caught in the west central area of Florida than anywhere else in the state. We also offer our offshore, deep-sea sport fishing charters in several different packages, including full-day eight-hour trips as well as half-day trips of either five or six hours. Plus, if you really want a complete day at sea, we even offer extended trips of nine or 10 hours. So whatever kind of trip you have in mind, we have you covered. We want you to have the best deep-sea fishing experience possible, which is why the FishTaxi Charters were built and designed specifically for Sport Charter Fishing. 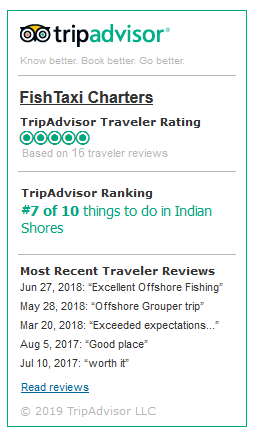 At FishTaxi Charters, you will find us to be extremely accommodating and we promise to provide a more enjoyable fishing trip for our clients, whether you’re an experienced angler or casting your line in the sea for the first time. At FishTaxi Charters we offer an unforgettable deep-sea fishing experience for people of all ages and skill levels. In fact, we are so confident in our service that we guarantee you will catch fish, or your trip is free. So if you’re ready to hit the waters of the Gulf Coast, and reel in some of the finest game the ocean has to offer, then give FishTaxi Charters a call at (727) 410-0021 to make your reservation now. Or, click here to reserve your trip online. Don’t let the big one get away.